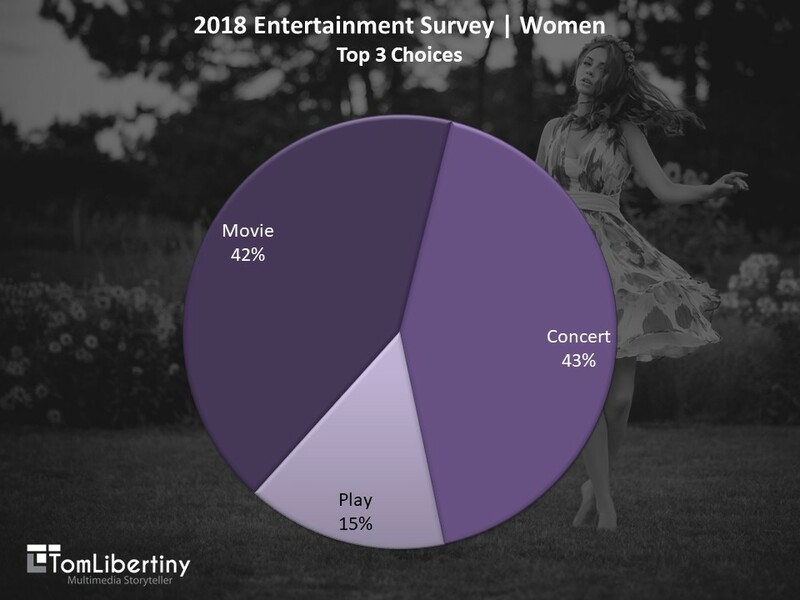 Results and observations from my 2018 entertainment survey about women and their entertainment choices. results of my 2016 survey. 2. 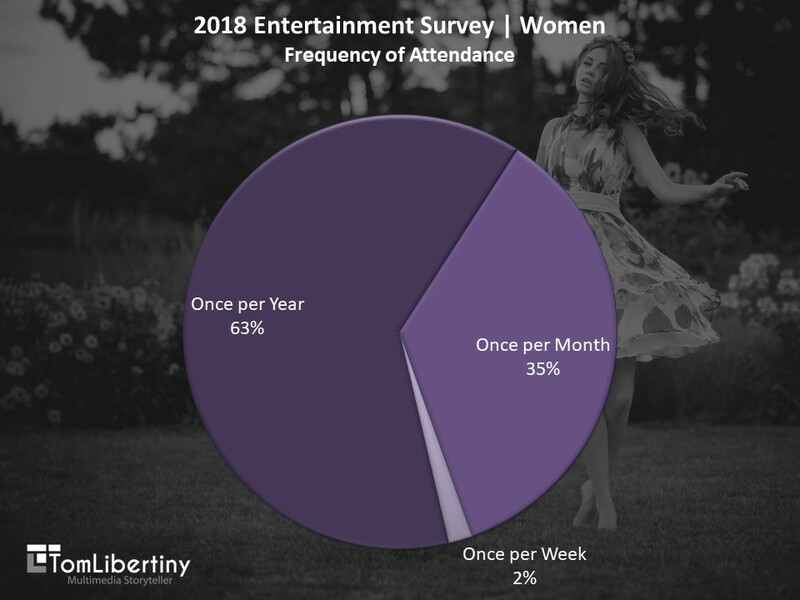 For women who were less frequent patrons of entertainment outside of their home, they selected special events: primarily concerts. 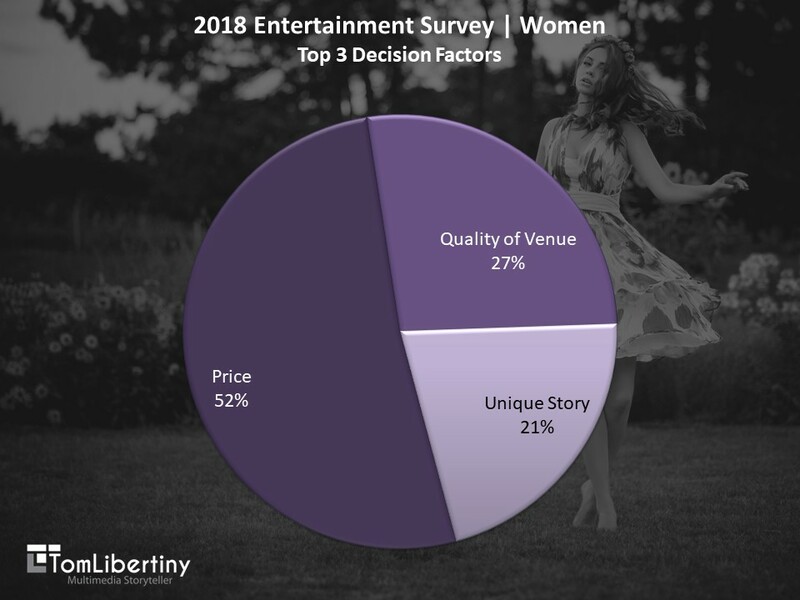 It wasn’t surprising that money was less of an issue, with the majority of women stating that they’d pay in excess of $50 per ticket and some as high as $150 per ticket. While the total acceptable ticket price increased; due to the decrease in the frequency of attendance, the total annual spend rate for women decreased. But, along with the increase in acceptable ticket prices came a noticeable increase in the required quality of a venue. Essentially, women are demanding unique live events held at a high quality or unique venues (Example: historic venues). Venue qualities that were important in 2016 (Examples: Good quality service, cleanliness, safe, easy-to-find, and available parking), are now a must-have. Find appealing, unique content providers. Ensure that your venue provides all the comforts of home in a unique venue and setting. Recruit new audiences while retaining your present one. By accomplishing these three items, over the long run, your advertising expenses should decrease as word-of-mouth advertising takes over. And with the increase in the acceptable per ticket price, your net margin per event should increase. As I said in 2016: The benefit of this business model: A much more diversified and larger overall audience that is more recession-proof. With the availability of so much entertainment in the home environment, coupled with the convenience of being at home, content providers and venue owners truly need to provide the very best in order to entice women to attend your event. You’re invited to Join my E-mail list for more Tips on this topic and many other art related topics. If you have a specific question, please contact me HERE.